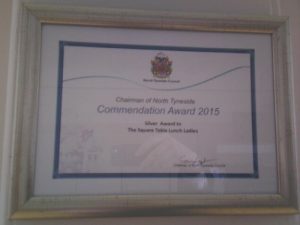 We are proud to announce that our Square Table Luncheon Club has been presented with a silver commendation award from the Chairman of North Tyneside Council. Three church members also received awards for their contributions to the local community. Once again, St Columba’s celebrated Easter with three services, at 08.30, 10.30 and 18.30, and a fair trade breakfast at 09.00. The highlight was undoubtedly a three-act play of the Easter story adapted by one of our members for the occasion. It was great to see such talent, along with many willing actors and actresses and accompanying sounds and pictures. 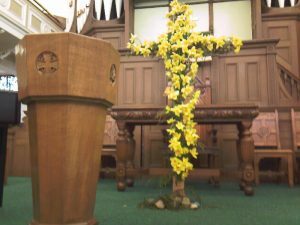 The main morning service also featured the decoration of the cross with daffodils as part of our prayers for the world.